Went out painting the other day with Shari. 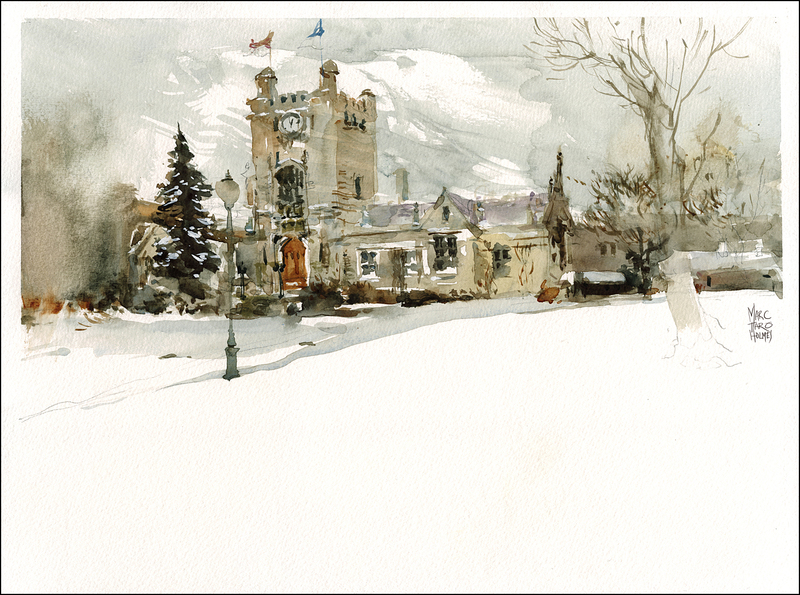 We practiced our Great White North version of plein air painting – sketching from the car. It’s not the ideal circumstance by any means :) A little cramped for space. I had a small bottle of water in the gearshift drink holder, and my clipped on palette-and-board combo leaning on the passenger side dash. It was worse for Shari behind the steering wheel. You have to alternate the heat from blowing on your feet to clearing the window. And your views are chosen for you, depending on where you can find snowplowed parking space. But, this is what you do in winter to get a chance for good conversation and urban sketching. Have to keep the brush in play, even in the grey months. There are beautiful days when it’s blue sky and the snow looks crisp and clean. But a lot of the time, the dominant colors in Montreal are warm grey. Overcast sky, wet sandstone, leafless trees and greeny-black pines. Lucky for me, I love these colors! I really enjoy these pieces. Beautiful. Beautiful paintings and working under those conditions. Great studio on wheels. These are just lovely. I’m glad you braved the cold and discomfort. Your sketches are beautiful. The wintry tones and composition are perfect. I did a few drawings in my car, and things got so much better when I sat in the back seat, with the front seat pushed as far in front as possible. Almost comfy! Well this tells who the big guys are. I need a huge amount of motivation to do this in winter even with the falling gasoline prices! 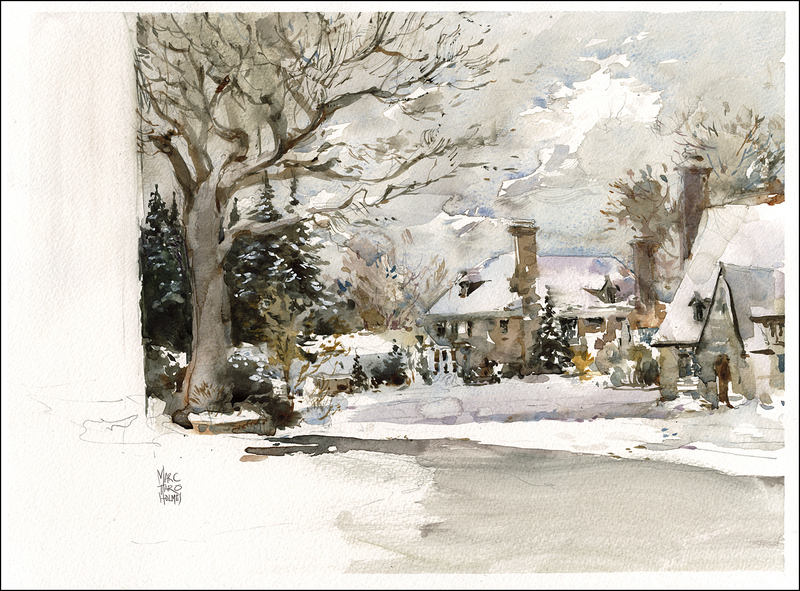 Well – I am in Vancouver, but your beautiful and evocative sketches make me want to go back East and brave the cold…just to see those buildings and streets in the snow again. Oh my, these are just brilliant! Lovely colours and composition! I love the detail..
Hurrah for your fortitude! Thank you for sharing your work….you really capture the mood but in a beautifully minimal way. Great paintings. What sort of temperatures are we talking about outside whilst you were painting? Actually it wasn’t too bad, I think -12C /-20 windchill. I’ve been out in worse for sure – but drawing is another thing entirely. Standing still will freeze you quickly! Plus the watercolor takes forever dry at low temps. Marc, I love your watercolors and sketches you have me inspired to go out and sketch more. Gorgeous! The Westmount City Hall one is just perfect to me. Just the right amount of detail.